This review has slight spoilers, those looking to go in completely blind, tread lightly. 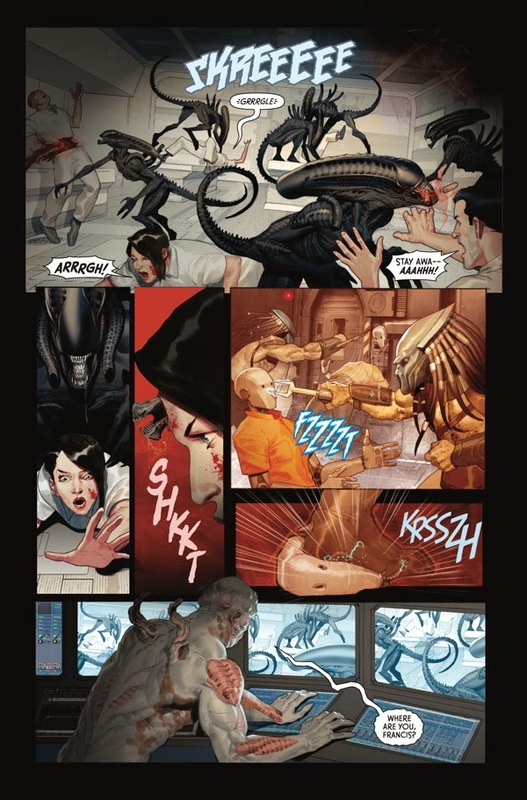 If you’ve read my review of Aliens: Fire and Stone #1 or heard our discussion about Prometheus: Fire and Stone #1 on the podcast, you know that so far we’ve very much enjoyed Dark Horse’s relaunch of the Aliens franchise. A week from today we’ll get the next installment, which throws the ritualistic hunters into the mix with Alien Vs. Predator: Fire and Stone #1, by Christopher Sebela and Ariel Olivetti. The crossovers between these franchises on the silver screen have been...let’s be generous and say pretty sub-par; does the comic do the epic battle between these two science-fiction creatures justice? Unfortunately, it’s pretty hard to tell. That’s largely due to the ordering of these Fire and Stone books. With Prometheus and Aliens, they tied together well but were not dependent on one another. 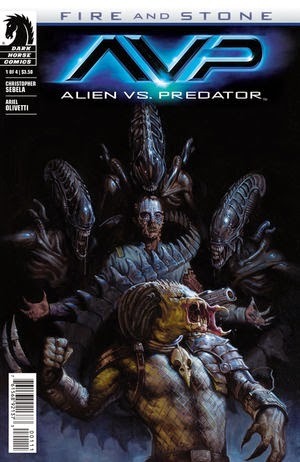 AVP follows Prometheus #4, which means it’s playing out a situation that doesn’t come out until December. And that connection is absolutely crucial–there are characters we know from the other two books, but what has happened to them is totally unclear, and most importantly there’s a villainous Engineer-esque monster after them that we have no clue whatsoever about. 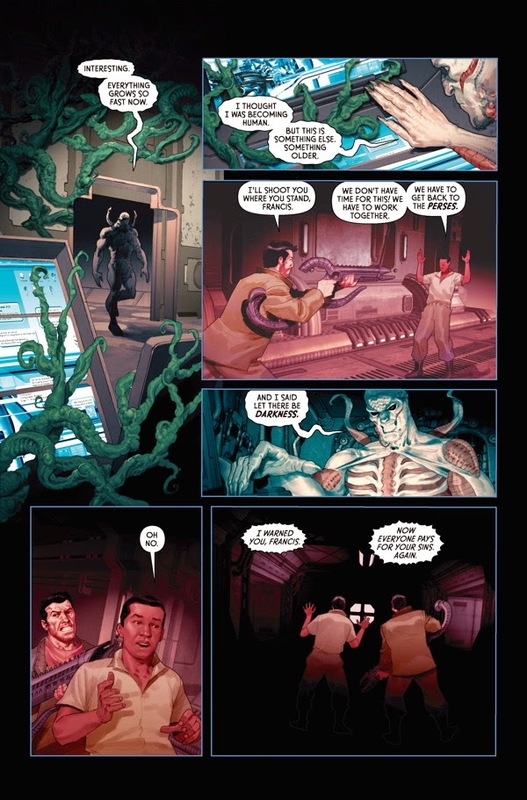 The issue focuses on Galgo and Francis trying to escape Elden, possibly an Engineer who somehow controls a group of Aliens. On top of it being utterly confusing, it’s unclear how he controls the Aliens, which seems to undercut one of the major themes of Prometheus, that even gods cannot control (or even survive in some cases) their creations. Oh yes, and there are Predators there, too. It’s not made explicit why they are on this ship as well, but assumedly there will be some kind of showdown coming. For a book called Alien Vs. Predator, though, there’s not a whole lot of plot regarding either. Fortunately, this first issue has one saving grace, and it’s a big one: Olivetti’s art is absolutely stunning. It’s not quite like anything I’ve seen before–a bit of Esad Ribic’s careful shading, but with a touch of impressionism in the right places. There are some interesting layouts, and he’s got a nice subtle way of making the characters/creatures stand out in an almost 3d sort of way by giving them more defined linework than the background. It’s really quite gorgeous, and saves the book for me. I think there’s potentially a good story in here, and certainly the art is worth revisiting. At this point, though, it’s hard to tell where its going, or more importantly, what's preceded it. It’s a bit bizarre to 1) have this follow the end of one of the books it is tying into and 2) have it precede the actual Predator book, which releases October 22nd. There’s a fair chance that this story, which might be the last chronologically in Fire and Stone, might be a great capper for the tale, but at this point I don’t know why or how the Predators are involved or even what’s going on with the principle human cast. Alien Vs. Predator: Fire and Stone #1 will be in comic shops on October 8th.